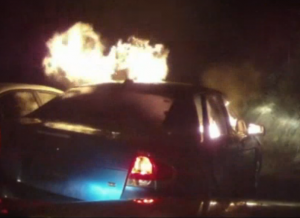 A newly released video shows a car exploding moments after a Border Patrol agent shoots a Taser at the driver in California, NBC San Diego reports. The driver, Alex Martin, died after the car erupted in flames. His family claims in a federal lawsuit that the Taser caused the explosion. His attorney said Martin was lost and traveling on the wrong side of a highway when Border Patrol agents in unmarked cars tried to stop him. “These agents approached in unmarked cars, in plain clothes and never identified themselves by the display of badges or even the simple statement ‘Border Patrol,’” the attorney said. Gabriel Pacheco, a lead Border Patrol union representative, said the agents followed procedures and would not have taken such drastic measures if the driver just stopped. Posted: 3/25/15 at 6:18 AM under News Story.